I’m already starting to get a little sad that summer is on the tail-end. With that being said, I’m trying to soak in as much summer cooking as I can before we truly have to say goodbye. I’ve had this salad on my list for a while now and it’s one of those recipes that I wanted to be sure to make before summer’s end. My, oh my! It’s so yummy and full of summer. 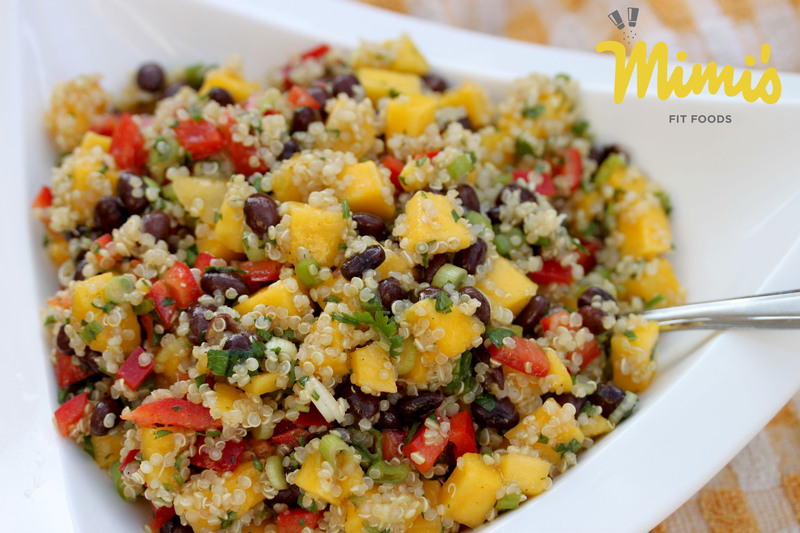 I’ve been seeing a lot of Quinoa-Mango recipes floating around and knew I was going to fall in love. That mango is so sweet and delicious next to the quinoa. I love having all the Tex-Mex flavors mixed in as well. We’re talking peppers, green onions, black beans, and fresh cilantro. The dressing tops it off with a nice tang. Fabulous, right? Seriously! You can’t go wrong with this dish. Even if you’re not a quinoa fan (what!? ), you’re going to like this. The quinoa is so subtle, yet you get all the health benefits from it. Meanwhile, you’ll be enjoying the texture from the crunchy, fresh veggies and you’ll also be hunting for that sweet mango. I mean, it’s a “win” all around! This recipe calls for cooked quinoa. I cooked about 2/3 cup dry quinoa and had almost exactly what I needed for the full 2 cups. Place the cooked quinoa in a large bowl. Add mango, red pepper, green onion, black beans, and cilantro. In a small bowl combine vinegar, olive oil, lime juice, salt, and pepper. Whisk until the dressing is smooth and pour on top of salad. Toss to combine. Chill the salad for at least one hour before serving. Hi Emilee! Hope all is well with your family! Hello Tonia! The closest substitute I would suggest is flat-leaf parsley. It is a distant relative to the cilantro and looks and tastes slightly similar. So, depending on the recipe you could try using the parsley. However, I can honestly tell you that I usually just leave the cilantro out in a case like this. Removing it may take away some of that “fresh” taste, but most recipes are still really good without it. Cilantro just tends to add a little “umph,” but don’t hesitate to leave it out. I have family members who don’t love the taste of it, so sometimes I leave it out if I’m making something that I know they’ll be eating. Everything is still devoured.